Deadly Recluse or Thornweald Archer maybe? HashMasta on Snap! Crackle! Pop! just a little thought, instead of Might of the Masses should try Chorus of Might of might or maybe Elvish Herder to garuntee big damage. I also think that you only need 2 of Lys Alana Huntmaster. Would get 1 more Elvish Visionary and Llanowar Elves instead. Finally I would get a Nettle Sentinel as a 4 of in this deck. Drop your Silhana Ledgewalker and Thornweald Archer. Would maybe throw archers in sideboard cause without opposing flyers, it doesnt seem all that great. Sorry if it was a bit mean but it is a good deck dont get me wrong. just if your gonna run 16 lands, you need more mana sources to make up for it and less cmc creatures. The only suggestion I have is to use Dwynen's Elite instead of Thornweald Archer. 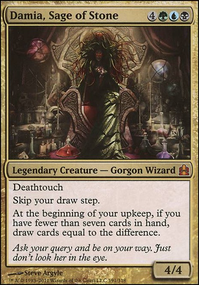 The archers would be a decent sideboard against flying/big creature decks, but if you want to maximize token production, I'd think Dwynen's Elite would be the way to go. Waker of the Wilds looks fun as heck. 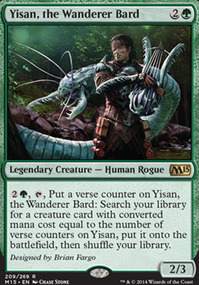 Genesis Hydra, Mistcutter Hydra, terastadon, Verdant Force, Void Winnower, and Terra Stomper are all pretty good budget big mana pay-offs. I would remove the enchantments for 4 Harmonize. 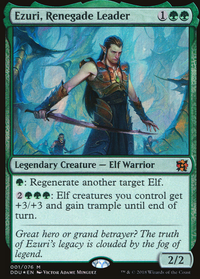 If you're dead set on running effects like Overgrowth, Arbor Elf is the kind of creature you want to be running. You don't need the Fog effects since you should be the one on the attack, but if you're running them for the hexproof, consider Blossoming Defense instead. I would go 4 Rampant Growth and 4 Search for Tomorrow in your sorceries. 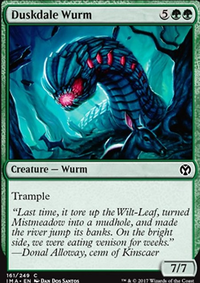 Nissa, Nature's Artisan is respectable, but I'd suggest Nissa, Worldwaker or Garruk Relentless Flip instead. I wouldn't run your enchantment or flier hate in the mainboard, instead fill it with the planeswalkers above, or more creatures like Elvish Visionary. One thing you really have to be aware of in Legacy is that the three most popular board wipes (to my knowledge) are; Terminus, Toxic Deluge, and Supreme Verdict. There's not a whole lot you can do against the first two, but have a couple Heroic Intervention in your sideboard could be important. I would also run a couple Life Goes On or Feed the Clan in the sideboard as well to go against more aggro opponents. Some fun spells to consider are Verdant Confluence, Primal Command, and Helix Pinnacle. Zealot of the God-Pharaoh is a pretty weak wincon; Lightning Bolt is pauper-legal, and with its 3 toughness, as well as its expensive activated ability, you probably won't be able to whittle down your opponent in time. Bitterbow Sharpshooters is a nice archer fatty that can pressure opponents freely since it has vigilance. 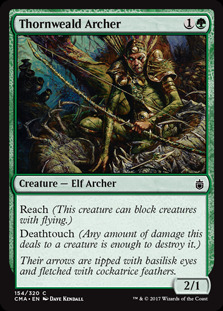 Since you're including Viridian Longbow, it might be worth including Thornweald Archer to destroy creatures every turn. Suggest cutting 2x Tel-Jilad Archers, 1x Hush, 1x Salvage, 1x Avoid Fate, 1x Shatter for 3x Bitterbow & 3x Thornweald or 4x Bitterbow and 2x Thornweald.